In recent years this property has been used as as undertakers, but older Thornburians will associate it with the butchers shop known as ‘Trayhurns’. Thomas Nelmes – Thomas was a pig butcher and he is listed in the 1830 Thornbury Directory. It appears that Thomas moved to Bristol which is where he and the family were living in the 1841 census. At some time before 1847 Thomas built a shop on the corner of St Mary Street and St John Street. 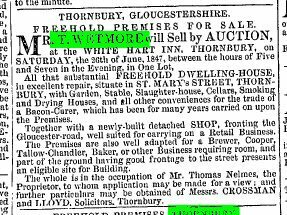 This is confirmed by an advert for the sale of Thomas’s property on 26th June 1847. The advert on the right is interesting because it refers to a ‘newly-built detached shop, fronting the Gloucester Road’ which was included in the sale. The implication of the word ‘detached’ implies that the house (later to be called 1 St Mary Street) which lies between the shop and The Plough had not been built – and this is confirmed by the reference ‘part of the ground having good frontage to the street presents an eligible site for Building’. The house, garden and outbuildings must refer to the part of Thomas’s property on the the site of where the Plough now stands, but we cannot say for sure whether it is the same building. George Thomas – on 23rd June 1848 George bought the newly erected shop on the corner of St Mary Street and St John Street for £200. At the time George was a shopkeeper in Rudgeway. The 1851 census confirms that they were still there. George is listed as a grocer aged 44 from Berkeley living with his wife, Hannah aged 43 from Elberton and their children: Edwin aged 18 born in Almondsbury, Ann aged 13, Jane aged 10, John aged 8, all born in Alveston and a visitor John Bendall an unmarried agricultural labourer aged 46 from Elberton whom we know was Hannah’s brother. John Barber – the 1867 rate book shows John living in the house. He may have moved to 1 Castle Street, but we don’t know any more about him. Some time between the 1891 census and the 1901 census Harry Maishment Trayhurn took over the family busines. Read about Harry Maishment Trayhurn and his family. 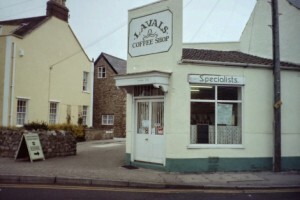 The Trayhurns Brothers finally sold the property to Northavon District Council on 14th January 1977. The Council paid £43000 for the shop and adjoining house and the Court House and Malthouse. The Courthouse and Malthouse were demolished and the land used by the Council as part of the Quaker Court residential home for the elderly. A new link road was built to the rear of the property joining the bottom of St Mary Street with Rock Street. This became known as Quaker Lane and the property previously known as 1 St Mary Street became known as 1 Quaker Lane. The shop and the house have been let by the Council. The shop was used for a short time as a cafe known as Laval’s (see photo on the right), then by an insurance broker, Greenman’s Insurance. A shop selling bowls equipment also traded there for a short time, taking advantage in the sudden interest in bowls following the opening of the indoor bowling centre at the sports and leisure complex. The property was taken over by Les Gulwell as the home of his undertaking business. 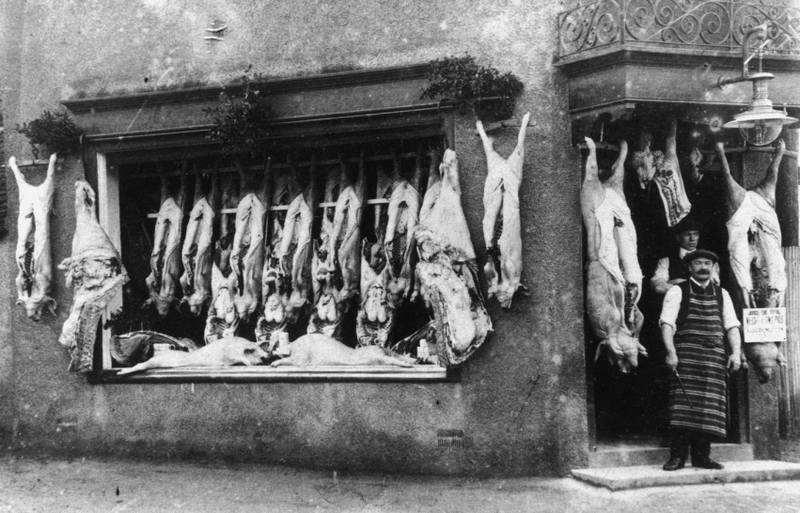 Les had previously worked as an undertaker with Elwyn Pitcher in his Gloucester Road premises. Les died on 2nd February 2009. The business continued under Les’s name.